We are a leading company in the field of hydraulic bursting and controlled demolition services. We have over 35 years of experience in offering hydraulic bursting and crunching services in London, Kent and rest parts of the country. Hydraulic bursting is ideal for sites with space and noise restrictions. Hydraulic bursting is a most efficient and safest technique for removing breaking large concrete, stone and masonry structures in the most manageable way. It produces minimal to zero noise and vibration during deconstruction. When accurate and noise-free demolition is required in places like schools, offices, hospitals, supermarkets and homes, hydraulic bursting makes the best solution. Hydraulic bursting involves the use of diamond drilling machines to create holes of different diameters (including 48mm, 127mm and 200mm) depending on the depth and overall size of the structure to be cut. Once diamond drilling is completed, hydraulic buster head is put inside the pre-drilled holes and raise the pressure of up to 2120 tonnes to achieve controlled breaking of the material. 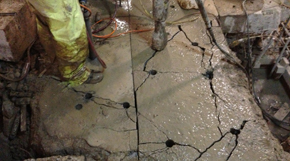 The high pressure makes concrete crack instead of getting shattered into small bits, reducing the risk factor. 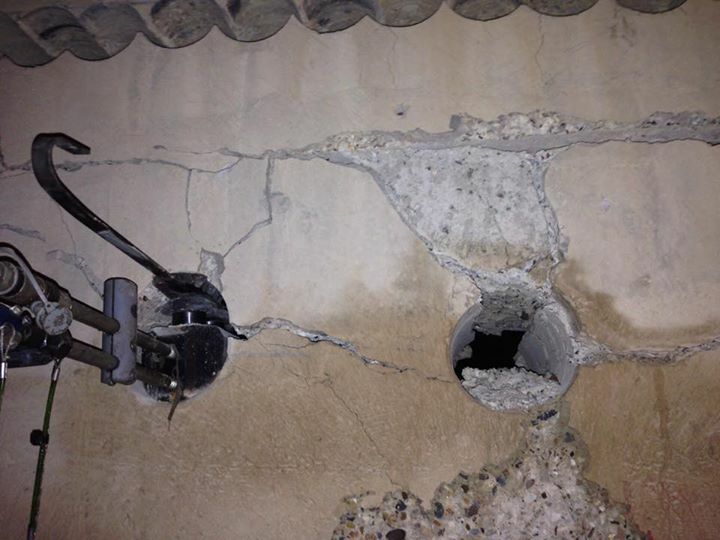 For larger concrete structures that need to be broken apart, the process is repeated until the entire structure is cracked into several small sections. When used with diamond drilling, the non-percussive hydraulic bursting process can remove any large size of the structure in quite, clean and safe way. Here at CA Drillers, we use shims/wedges to further separate concrete from steel reinforcement. Our powerful and robust hydraulic shears can easily cut through steel reinforcement. We have been using this demolition technique for thick concrete masses, rocks, floor slabs, footing bases, walls, and many other types of structures. While it is not as fast as conventional demolition techniques, hydraulic bursting offers many other advantages as mentioned below. When you choose us for hydraulic bursting service, we make you benefit from our wealth of experience and expertise into the niche. If you need to learn more about the hydraulic bursting service we offer, contact us today. We are just a call away!